Thus far this week, I have logged 20,000 words on my current WIP. This is neither as many as I had wanted to write, nor as few as would make me pout. Twenty-thousand are enough, however, to cause extreme intracranial pressure, such that I long to be trepanned. What, you ask, is trepanning? The figure at left should give you an idea. Yes, that’s right, it’s an ancient medical practice that involves drilling a hole in the writer’s, I mean, patient’s head in order to relieve pressure on the brain. Ah, that sounds so pleasant. It looks rather pleasant, too, doesn’t it? I hear I can still get one performed in Mexico for a reasonable price. What do you think? Do you feel you need a trepanning after writing 20,000 odd words (and by that, I truly mean ODD words)? Well, I think that man’s expression says it all. Good night and God bless you all. May God shine his light through the hole in your head. And, yet, Joel, you are the first person who suggested trepanning as a viable option to deal with my "issues". So who's the disturbed individual? Yes, anon, trepanning. That's all I have to say about that. Just stopped by to say hi…. "Hi"
covnitkepr1 secretly wants a good trepanning; he just doesn't know it yet! This is really funny! haha. Trepanning…never knew such a term existed until now! 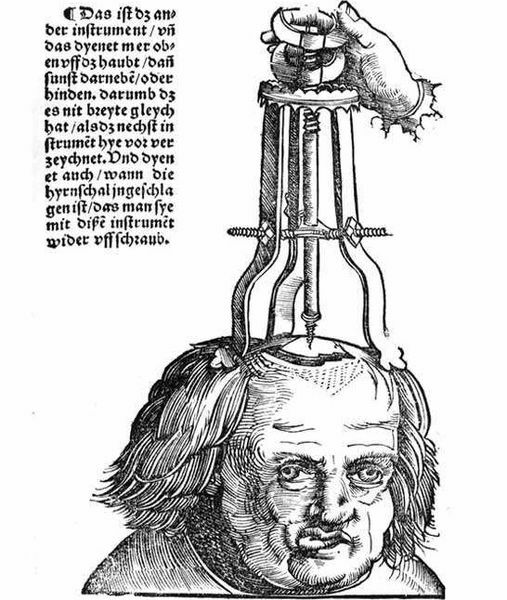 If someone asks me how to get over a writers block, I'll say: Why don't you try trepanning? May the light shine on you as well, my Blogging Buddy. Sorry I have not been to your page lately. Life has been crazy. I am in the middle of moving from Florida to Alaska. Worn out and the movers come in two days! I will be offline for a few weeks but I am already looking forward to catching up on some good Jill Reads!